I've talked about my previous dislike for racing games on the blog before, and though I did generally used to hate them back in the day, I did like a few if I'm being honest. I loved the likes of Tony Hawk's Pro Skater, Road Rash and Skitchin', though those last two are kind of illegal “sports”, right? Anyway, I loved the hell out of stuff like that, so when MotoGP 15 popped up to review for the blog, I jumped at the chance to play it. In theory it's essentially the same as Road Rash, right? Well, without the ability to smack a cop in the fact with a steel chain, of course. Developed by Milestone S.r.l. and out now on Playstation 4, Playstation 3, Xbox One, Xbox 360 and PC comes MotoGP 15, another yearly release of the MotoGP series that, while good, doesn't really improve upon MotoGP 14 much. This is the part where I usually dish into the plot of the game I'm reviewing, but there ain't no plot here. If there is a plot it's that you play a dude who rides on a bike. The end. Joking aside, in career mode MotoGP 15 puts you in the shoes of an unknown biker as they claw their way from the bottom of the leader board to the top. It's all really mundane stuff really, but people who play sports games aren't really seeking a plot though, as they're more interested in that thing called, you know, gameplay! However, before you even get a feel for the gameplay you'll quickly notice MotoGP 15's visuals. For a game that you'll most likely play on a current-generation console, the tracks don't particularly jump out at you. From the outset you'll often notice that locations are rather bland, and though they do tend to look much better during heavy rain and other snazzy weather effects, it's just not up to par with other games in the genre. In fact, Ride, a similar game released this year and even developed by the very same team as MotoGP 15, looks far, far better than what's on offer here. It's not terrible by any stretch of the imagination, but it's certainly not what you're probably expecting. That said, the bikes do look pretty nice during a race, and with the added options of being able to customize both your rider and your bike, the game does have its fair share of unique visual flair. Handling of the bikes are pretty great across the board. From those moments where your competitors are in your dust, or taking the last corner on pole position during your final lap to times when you're literally neck and neck with a guy, MotoGP 15 gives you a great sense of all the glory, tense and heart pounding moments that go hand-in-hand with the sport. It goes without saying that all the bikes included in MotoGP 15 feel vastly different from one another, and if you're starting off in career mode, you'll find yourself in Moto3 riding a rather disappointing bike. But fear not, because as you rise the ranks in MotoGP 15 from Moto3, to Moto3 and then MotoGP, you'll find yourself being able to use increasingly faster and more powerful bikes. 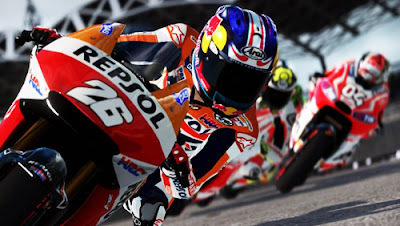 Though MotoGP 15 veers away from the insane realism that Ride dived into, I actually really enjoyed the slightly arcade-like take on the racing. It's by no means a simple racer, but it isn't as punishing as other games out there. For instance, there's a nice little feature that essentially lets you reverse time, meaning that during gameplay if you make a mistake, you can instantly turn back time and pick up from an earlier moment before you screwed up. Overall MotoGP 15 doesn't do a lot that MotoGP 14 didn't already offer you. If you're new to the series I'd suggest you give it a go, but if you've played previous MotoGP games or even Milestone's Ride earlier this year, I'd say give it a miss. What it does it does nicely, but with bland visuals and slightly repetitive gameplay hampering its achievements, it's just not as good as it should be. MotoGP 15 comes in third place with a 3/5.